01 Oct Bulbs for Breast Cancer Fundraiser is THIS WEEKEND! This weekend is our annual Bulbs for Breast Cancer fundraiser. I started this event many years ago to help raise money for a wonderful local group, After the Storm. After seeing what my sister went through following her breast cancer diagnosis and treatment, I quickly realized that the emotional, spiritual, and physical help that After the Storm gives is invaluable. 10% of all the bulbs that you purchase on Saturday and Sunday will be donated to them. Come in, buy lots and lots of bulbs, make your garden more beautiful, and make your bulb buying dollars really mean something! My Saturdaymorning workshop will focus on how to use bulbs to add tons more color to your landscape from February through July. 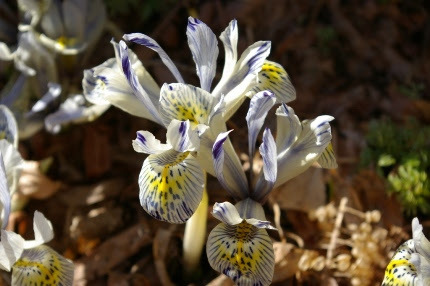 I will explain which bulbs bloom when, a true study of succession of bloom with bulbs in CT.
Iris ‘Katharine Hodgkin’ is a diminutive, April blooming iris with exquisite blue coloration. Bulbs are just so easy to plant. If you have an existing garden, you can pop them in between the crowns of the plants. New areas should be prepared as you would any garden, using compost and organic fertilizers. 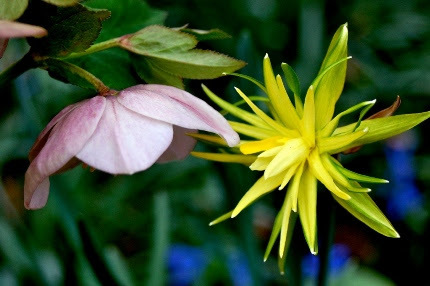 ‘Rip Van Winkle’ dwarf Narcissus and pink Hellebore jazz up the April garden. Bulbs can be added to your foundation plantings, by your mailbox, and in the beds surrounding your deck or patio. Many are great as cut flowers and some simply make your heart sing in early spring when they appear (such as the dwarf blue and white iris pictured above). Many bulbs are exciting and architectural. The Allium schubertii at the top of this newsletter is three dimensional, with starburst lavender flowers forming huge orbs. I dry these for fall arrangements and everyone talks about them when they are blooming in the late spring garden. 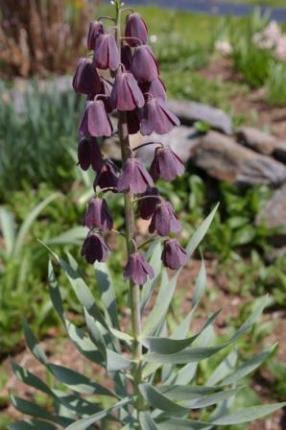 Fritillaria persica is a very unusual bulb that has been coming back in our perennial gardens at the shop for over TWENTY years! The bulbs are quite aromatic and repel voles and chipmunks. Just when is the correct time to plant bulbs? This is going to be a rainy week (thank goodness, we need it so desperately) and the timing couldn’t be any more perfect. If you buy your bulbs this weekend, the soil will be ideal for planting next week. If you prefer to wait until your perennials start to go dormant in late October, they can be stored in the garage or shed. Bulbs are just so forgiving and easy to work with. A rainy week means that ideal fall planting time is finally here! Come on in and fill up a wagon today. The welcome rain also sets us up for wonderful five weeks of planting ahead! I have said this many times, and I will say it again: I do almost all of my plantings at home in the fall. Spring is just too busy and in October, it is very clear to me where I need more color and where I need to fill in the blank spots. I also do all of my rearranging and dividing in October. I have Japanese irises and daylilies to split, self sown ironweed and aster plants to relocate, and an ever-growing pile of perennials, flowering shrubs, and evergreens to put in strategic places around my yard. Eupatorium hyssopifolium has fluffy white flowers and grows 2-3′ tall. It is a great native plant that combines well with ornamental grasses and tall asters. We have so many wonderful habitat plants on our benches this week. 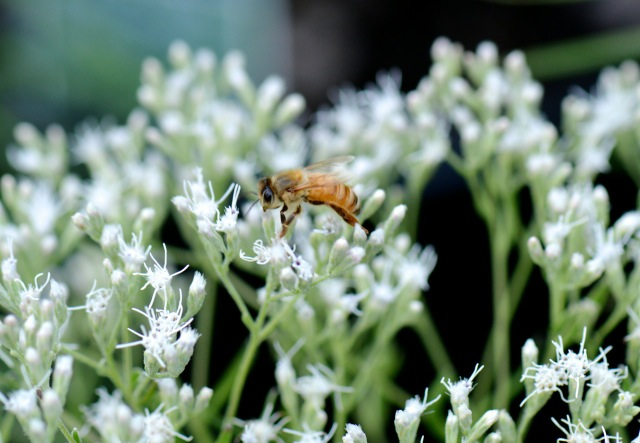 I spent a lot of time in my gardens on Sunday and Monday simply observing the honeybees, bumblebees, and other pollinators, trying to understand what nectar flowers they appreciate the most at this time of year. 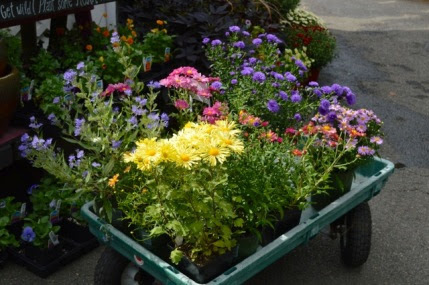 Eupatoriums, Asters, mums, goldenrods, Sedums, herbs (such as mountain mint and arugula flowers), Rudbeckias, perennial sunflowers, and butterfly bushes seemed to attract them like magnets. Helianthus ‘First Light’ is just starting to flower this week. Last fall I planted Helianthus salicifolius ‘First Light’ in the bed next to my deck. This plant has tripled in size this year and is just starting to open. Hundreds of cheery, yellow daisies line the stems, making it both an ideal pollinator plant and a long lasting cut flower. 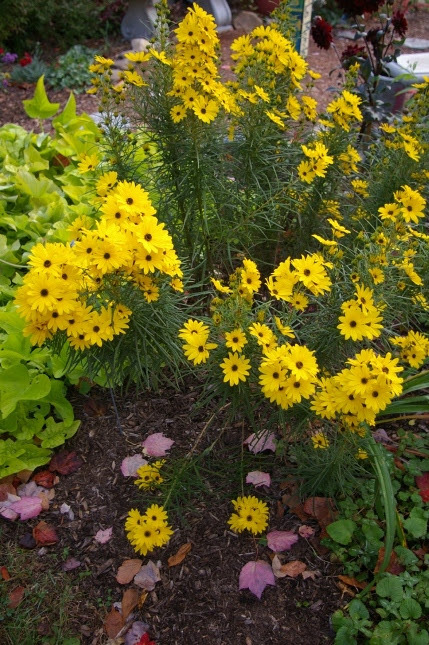 Often called “the rosemary leaf sunflower”, the leaves are thin and linear and look good all summer long. It grows 40″ tall. I paired mine with one of my favorite grasses, Molinia caerulea ‘Skyracer’. We have a bunch of Helianthus ‘First Light’ in stock; last year we ran out the minute it began to flower. 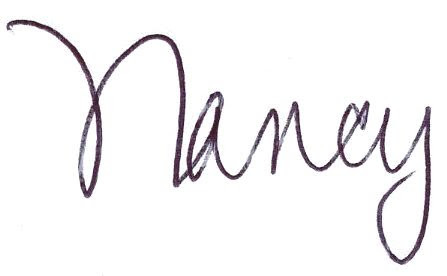 Don’t miss your chance to add this great perennial to your permanent collection. 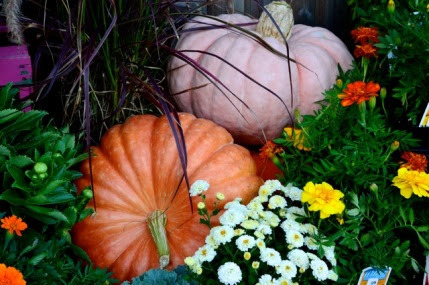 Marigolds, mums, and pretty grasses all compliment our great selection of pumpkins. The time for fall decorating is here! The rainy week also means that it’s finally the ideal time to seed and fertilize your lawn. You should also consider taking a soil test or two from your lawn and garden beds so you can correct any deficiencies this fall. Lime and mineral powders take a while to work, applying them in October makes great sense. We are actively topdressing many of our client’s gardens with compost this coming month as well. The prolonged drought showed us the value of organically enriched soil. Adding compost in the fall is one chore that will save you a lot of work next spring. Please make it a point to take part in our Bulbs for Breast Cancer fundraiser this weekend. Spread the joy of bulbs, and of helping others in need, throughout your neighborhood and among your family and circle of friends.